Looking for a more natural means of treating common ailments in your household? There are other options besides over-the-counter medicines – and you probably have many in your house already. 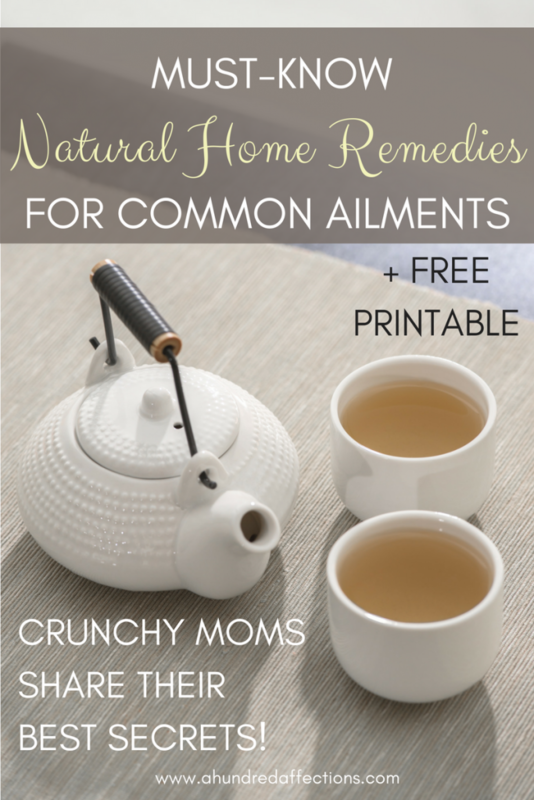 Learn about Natural Home Remedies for Common Ailments- top tips and tricks from crunchy moms! Truth be told, I’m not the crunchiest of moms out there. I don’t make my own laundry detergent or house cleaners (yet! ), Trader Joe’s isn’t the only place I buy my food, and my kiddos eat frozen chicken nuggets for dinner more nights than they don’t. But, you know, with kids, that mama bear instinct comes out, and you just want to protect your kids from everything harmful in the environment. I’m only about 3 years in as a mom, so I know I have lots to learn, but I’m definitely making the shift in creating a healthier, more natural home for our family. I can’t control the environment and what happens outside my house, but inside these doors? 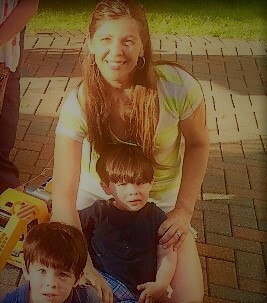 I truly believe it’s my God-given responsibility to look out for my 2 little guys and my family. This has been a rough winter for sickness for my family (relatively-speaking). No flu, thank God, but that upper respiratory thing? Oh my gosh. I got it first for a 2 solid weeks, then my husband, then one of my sons. All right before Christmas. Thankfully, we were all functioning on most cylinders during the holidays, but right around New Year’s, both of my sons got it. Bad. Very bad. Then my husband. Then me again. The end result: the twins and I were homebound for 21 days. Twenty. One. Days. In the house. With twin 2-year-old boys. Sick twin 2-year-old boys. Now, I know that with little kids, they just have to look in the general direction of another child, and the chances are great that they’ll get sick. But I also realized that I can do a better job at keeping my family healthy. My hope is that I can move away from over-the-counter meds and try more natural means to help with sickness. My deep-down gut feeling is that God has provided so much of what we need already out in nature. I’m not opposed to man-made medicine, but I really want to dig in and see what God has generously given us in His creation to use for our health and healing. Who better to ask than the crunchy moms out there who are doing it already? I took an unofficial survey of some of my crunchy mom friends on my personal Facebook page, and I also put it out there in a crunchy mom Facebook group or two. 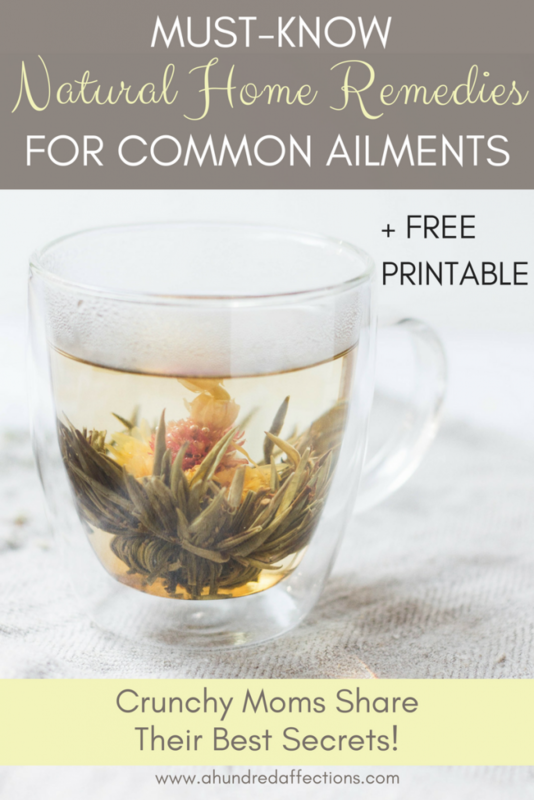 I wanted to know what their best go-to natural and/or home remedies were for common ailments such as colds, congestion, flu, fevers, muscle aches and a whole bunch more. The results were amazing! First, I had no idea that so many of my friends were crunchy – ha ha! Second, so many of these remedies seem so easy – stuff you probably have in your house! Just from their initial answers, you and I would both be smart to make sure we have some garlic, Epsom Salt, ginger and apple cider vinegar on hand. Those seem to be the cure-alls, mentioned several times for many ailments. First, I want this list to be accessible to everyone, not just those who use essential oils already. It can be a significant financial commitment to begin the initial road with essential oils, so I want to provide useful information for those who aren’t EO users. Second, I do believe in the good uses of essential oils – and there are many – so I’m going to cover EO in a separate post down the road. 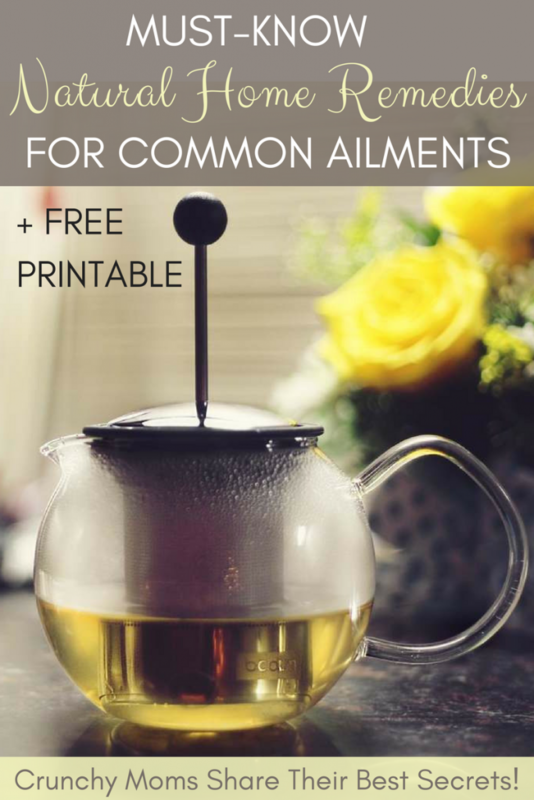 I’ve also included some links to some healthy remedy recipes – a great idea to have some of these on hand and ready to go. These moms also gave me a couple of their go-to websites, which I’ve listed below also. If there’s something you are specifically looking for not listed here, check out those sites also. Of course- the disclaimer: “I’m not a doctor, please don’t sue me!” But seriously, I’m not a doctor nor do I have any health training; I’m just passing on what crunchy moms swear by! As always, please check with your doctors first, especially if there are other medications or health issues involved! Garlic Oil in the Ear or 1/2 Raw Garlic placed on ear for 20 min. I was so encouraged and inspired by this! These moms make it all seem so doable and normal. Even today, I’m having awful muscle pain in my shoulder and neck. As soon as I’m done here, I’m going to mix up a batch of apple cider vinegar and coconut oil and start smearing it on! I’m not sure if I’ll ever be full-on crunchy, but I am so looking forward to making natural home remedies a part of our lifestyle. It makes my heart feel at peace to know I’m doing something proactively to help my kids in their health and to promote a healthy lifestyle. 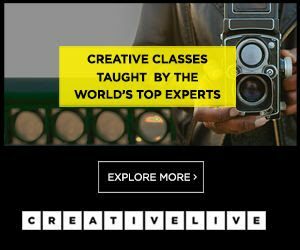 Are you a user of home or natural remedies? Are there any that I missed? I’d love to hear your thoughts. If you enjoyed this article and think others might too, I’d be grateful for any shares! 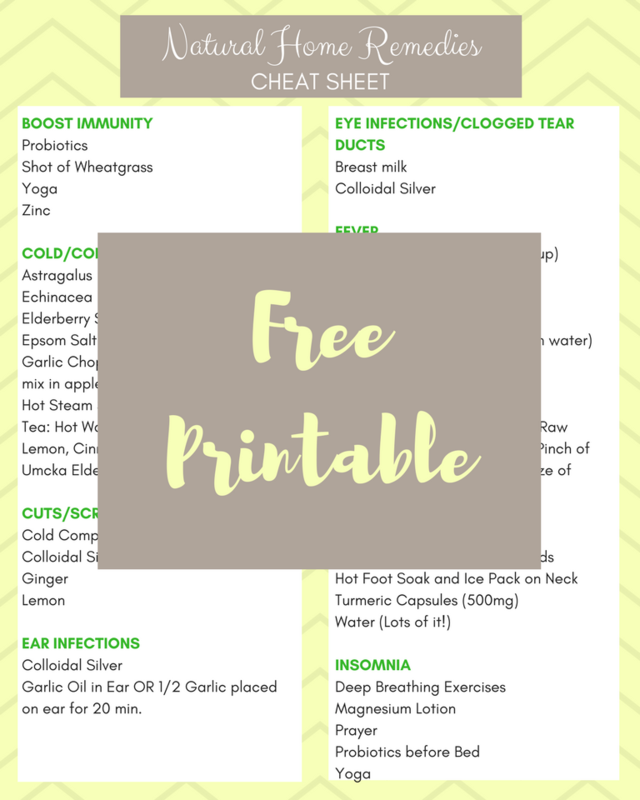 And don’t forget to grab your free printable download of these Natural Home Remedies for quick, easy access! I'm sick of sickness too. I feel you about the 21 days. I hate being stuck inside for so long. My 3 girls, husband, and I were all sick before Christmas and also during Christmas break. My girls were also sick again recently. I'm ready for warmer weather and no more sickness. Thanks for coming by, Christina! Yes, I have heard so much about ACV. It's in my cabinet, but I always forget to use it. I know so many people take it daily as a preventative method.... definitely need to add that on!